HQ Pro-Stitcher is an intuitive computer-guided quilting system designed especially for use with Handi Quilter long arm quilting machines. User friendly and simple to operate, the seep-by-step process for each function is easy and fun. 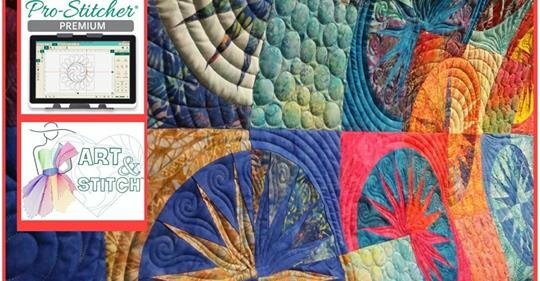 Whether finishing your own quilts or considering a quilting business, this is your opportunity to learn the elegant and precise quilting you can accomplish with an HQ Pro-Stitcher. Topics covered will include an overview of support resources available on-line and demonstration of the HQ Pro-Stitcher Simulator. This class moves from the overview to quilting applications. An extension of the morning classes address specific functions and basic techniques a quilter will use on a regular basis to finish quilts with the HQ Pro-Stitcher. Topics included will include the difference between reposition, nudge and drag and drop and edge to edge designs. In this comprehensive class, students will learn all about the Handi Quilter Pro-Stitcher Premium program using hands-on and simulation. After mastering dropping block designs and quilting edge to edge with the HQ Pro-Stitcher you will expand and strengthen your skills. This class focuses on in-depth aspects of specific functions of the HQ Pro-Stitcher. Topics include more advanced techniques such as modifying designs, using the record, mark, move and new start and end features. Creative use of designs including feathers will also be covered. Expand your creativity! In the next hands-on sessions you will learn the updated Art and Stitch Version 4.1 and the how to use a wide variety of Art and Stitch tools. Topics to be included include create your own designs, modify existing designs, draw over a backdrop, project design over quilt, transfer designs to Pro-Stitcher and much more. A couple of hundred Motif fills are included in Art and Stitch. That’s not enough, so you will learn how to create your own Motif Patterns in this class. You can use Motifs to fill a closed space or fill around a closed shape, use two motif patterns in one fill, letting rows of motifs interlock. Also learn how to play with multiple layers perpendicular to each other and see the special effect of creating and using large motifs and a trick how to fill the space between other designs that touch each other. Creative Fill function can be used to fill large spaces. Learn all about the artwork based Creative Fills. How to use Creative Fills inside and around a shape using fills from the library or your own design. You will also learn how to make a closed shape repeatable and use as a base for a creative fill, special techniques to make background fillers and continuous paths to be used around a shape. All classes include handouts. You will need a laptop computer with Art and Stitch Version 4.1 loaded. The trial Version is available at www.artandstitch.tv/update.html the trial version is fine for class. You do not need an activated version to participate. You can use all the tools within Art and Stitch but you will not be able to save what you create with the trial version. Load the program at least a few days BEFORE class. You will not be able download the latest version during class. Don’t forget your power cord, mouse, paper & pencil for note taking, dry erase marker and USB drive. seeking innovative ways to use both, Susan now enjoys quilting professionally with the HQ Infinity. Registration closes April 2. Bring lunch or order in.